Check out all our fabulous Sweet Potato Recipes! Smashed Sweet Potatoes with Bacon and Bleu Cheese are absolutely, unequivocally one of the easiest and most impressive side dishes I make. 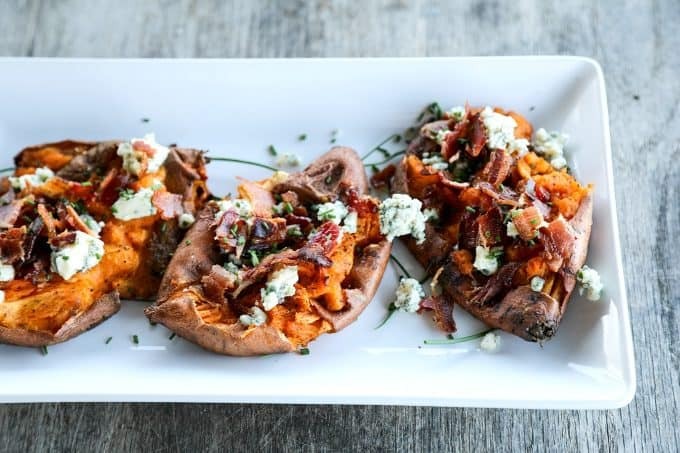 It may be a bit of an ugly duckling, looks-wise, but there’s something magical in the power of the sweet potato to be transformed into a gorgeous, savoury side dish in the presence of creamy bleu cheese and smoky bacon. 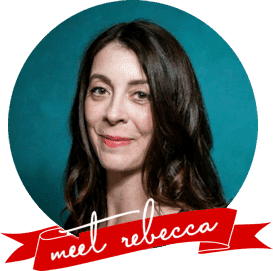 We start with young, small sweet potatoes (save the gargantuan sweet potatoes the size of small watermelons for Melting Sweet Potatoes, please!) so the skins are tender and we can leave them put. The sweet potato itself is cooked twice; don’t let that put you off. The first cook is just to steam them to tender. This can be done in a steam basket or in the microwave. The second cooking is where the magic happens. First we drizzle the pan with some bacon grease. Just a bit. 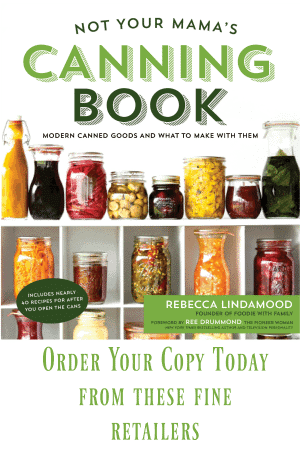 It’s there to keep your sweet potatoes from sticking to the pan. We smash the potatoes enough to break up the skin and leave some craggy outposts of sweet potato that will crisp up beautifully after we drizzle them with a bit more bacon grease and then slap the pan into a screamingly hot oven. Oh, that high heat. I know it makes many of us nervous; but what beautiful things it does to smashed sweet potatoes! The inside stays tender, soft, and mild while the outside gets crisp, caramelized, and bold. All that’s left to do then is crumble some creamy bleu cheese over the top, scatter the crisp bacon you cooked to get the bacon grease, and toss some fresh, mildly oniony chives over the top to complete our little bites of heaven. I know we food bloggers tend to overuse superlatives to describe our food, but this one deserves them. 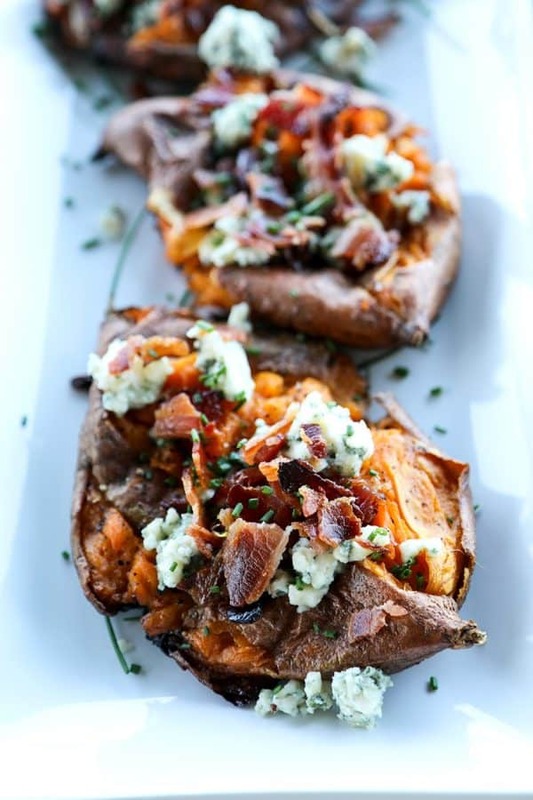 Smashed Sweet Potatoes with Bacon and Bleu Cheese truly is crave-worthy. I bought a bag of small sweet potatoes from my grocery store that included instructions for microwaving them to tender in bag. That cut down on prep time and mess and I can say from experience that it works quite well. If your store does not carry them, look for the smallest sweet potatoes in the bulk bin. You’ll get double use from your bacon as you will use both the grease and the bacon itself. Just save a bit of the grease after you take the bacon from the pan. Score the skin on the top of the sweet potatoes before you smash them. This will allow you to control where the tender insides stick out of the sweet potato skin. When you smash them, you want to press down hard enough to have some exposed sweet potato in and among the skin, but you still want them to hold together, so don’t completely flatten them or break them up. This gives the best result after roasting. Use whichever bleu cheese you like best. 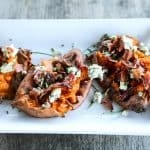 I’ve made Smashed Sweet Potatoes with Bacon and Bleu Cheese with applewood smoked bleu cheese, gorgonzola, Danish bleu, and Maytag and loved them all. Drizzle 2 tablespoons of the bacon fat on a sheet pan. Add the tender sweet potatoes and toss to coat lightly. Use a knife to score the skin then use a potato masher or the bottom of a measuring cup to smash the sweet potatoes so that some of the inside protrude from the skins and they are relatively flat, but still hold together. Drizzle the remaining bacon fat evenly over the tops of the smashed sweet potatoes and bake in the hot oven until crisp and caramelized around the edges, about 18 to 22 minutes. Use a flexible spatula to transfer the sweet potatoes to a serving dish, garnish with the crumbled bleu cheese and the minced chives. Love this! Definitely trying soon! Cheers! Bacon AND bacon fat…….Come to Mama!!!! I practically live on sweet potatoes these days, so I’m psyched to try this recipe as well as the referenced Melting Sweet Potatoes. Both of these look like they’d make great leftovers, in addition to superstar vegetarian dishes! Any pointers on how long to microwave/steam them to tender?